The Modi Years: Did Indians find jobs or lose them? An official survey showed unemployment touched a 40-year high. But the government does not accept it. One of the main promises of the Bharatiya Janata Party in its 2014 manifesto was the creation of jobs. Holding the Congress-led United Progressive Alliance government responsible for “ten years of jobless growth”, it promised to reverse the trend. Five years later, the Narendra Modi government’s record on employment is mired in controversy as an official survey showed India’s unemployment rate rose to its highest level in 40 years in 2017-’18. The government withheld the release of the survey, prompting two members of the National Statistical Commission to resign. After the survey’s findings were reported by the Business Standard in January 2019, officials of the Modi government’s think tank NITI Aayog first claimed it was not final, then sought to discredit it. The Modi government has instead relied on other much smaller data sources, like the Employees Provident Fund and the MUDRA scheme which advances loans to small-scale entrepreneurs, to maintain it has improved the jobs situation. Independent large-scale surveys, however, show a worsening picture. More than ten million jobs were lost between December 2017 and December 2018, a survey by the Centre for Monitoring Indian Economy found. With much of the jobs debate focused on numbers, here is a look at the main methods used to measure jobs in the economy and what they reveal about the employment situation under the Modi government. The most reliable method of estimating employment in a country like with a large informal sector is the household survey which collects data at homes and not at workplaces. It reflects employment levels in both the formal and informal economy. The National Sample Survey Office under the Ministry of Statistics and Programme Implementation as well as the privately-run Centre for Monitoring Indian Economy use this method. 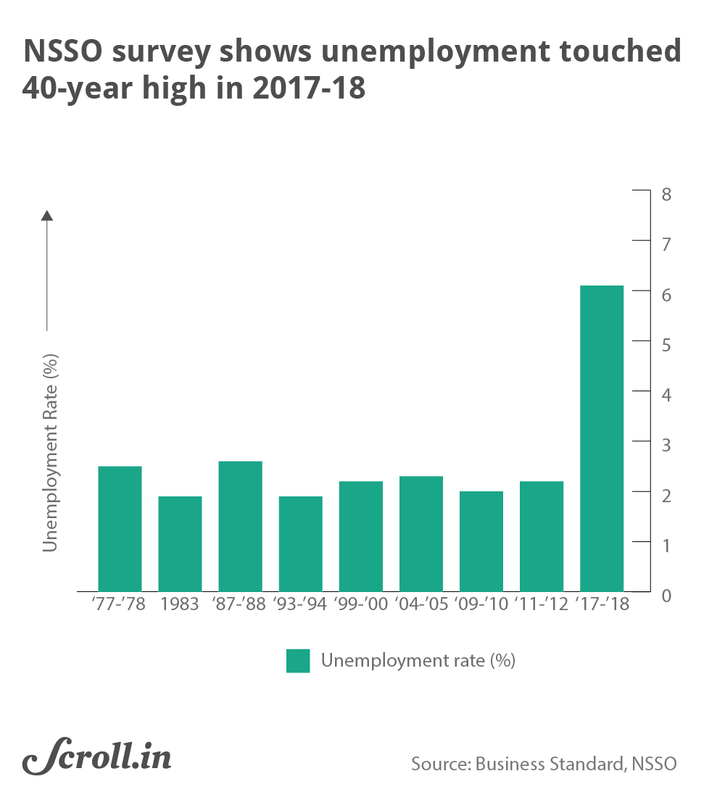 Since the 1970s, the NSSO conducted a large-scale household survey called the Employment-Unemployment Survey every five years. The last survey done in 2011-’12 showed an unemployment rate of 2.2%. To generate more timely data, since 2010, the Labour Bureau of the Ministry of Labour and Employment also conducted an annual household survey. In 2016-’17, it showed the unemployment rate had risen to a four-year high of 3.9%. 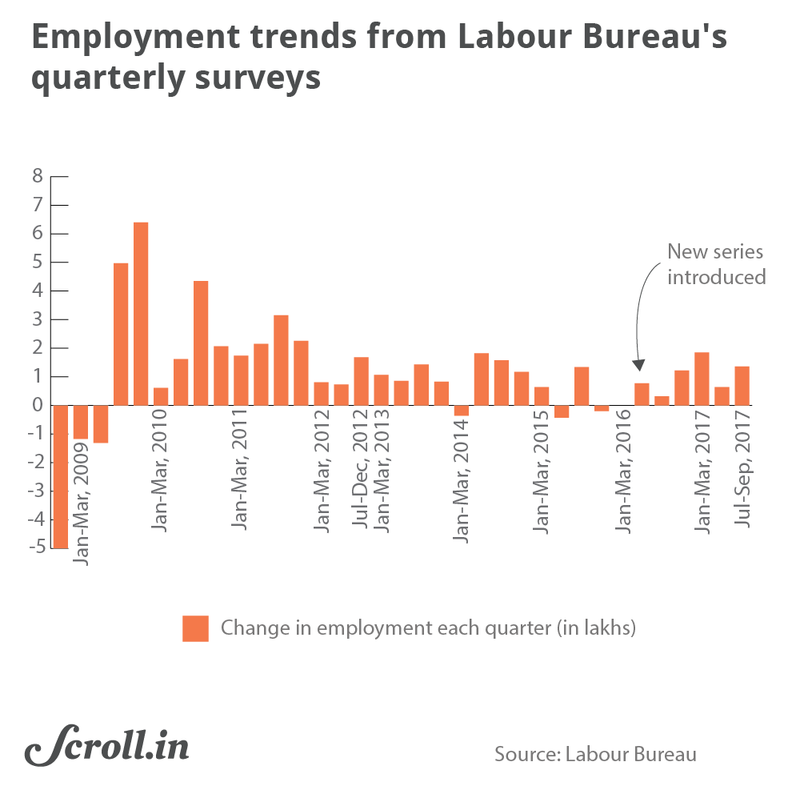 Since then, the Modi government discontinued the Labour Bureau’s household surveys and replaced the NSSO’s five-yearly exercise with an annual survey called the Periodic Labour Force Survey. The field work for the first round was done between June 2017 and June 2018. In January 2019, after the government refused to release the survey, it was leaked to the Business Standard. It showed a surge in the unemployment rate to 6.1%, the highest in four decades, with increasing joblessness among all social groups, and educated youth reporting the highest levels of unemployment. One measure which captured whether the person surveyed had found work that week revealed even higher unemployment level of 8.9%. This tallies with ground reports that had shown large-scale job losses among daily wage workers in the aftermath of the government’s decision to demonetise high-value currency notes in November 2016, followed by the botched-up implementation of the Goods and Services Tax in July 2017. The government initially dismissed the reports, claiming the leaked survey was merely a draft. The chief executive officer of the NITI Aayog, Amitabh Kant, subsequently wrote a column in the Business Standard arguing the survey was not comparable to previous ones and criticised its sample size and methodology. In a rebuttal, PC Mohanan, who had resigned as the head of the National Statistical Commission in protest against the government’s refusal to release the data, said the survey was comparable and had not released simply because it “purportedly contradicted certain carefully cultivated narratives”. Another way to estimate employment trends in the economy is by collecting data at establishments, but this only reflects employment levels in the formal economy. The Labour Bureau under the Ministry of Labour and Employment conducts Quarterly Quick Employment Surveys that measure employment in eight sectors of industry and services by surveying enterprises with more than 10 workers. These surveys show the net jobs created in eight sectors of the Indian economy declined sharply from 10 lakh in 2011-’12 to just 4.16 lakh in 2016-17. While reporting the data, a government press release pointed out the survey covered employment trends for only 2.4 crore workers against 47 crore workers in total workforce. A government panel has recommended the quarterly surveys be discontinued due to poor quality and coverage. The Modi government has argued a better way to estimate employment trends in the formal economy is by using the data of workers registered with the Employment Provident Fund Organisation, which helps workers save towards retirement, death and disability. Data released by the EPFO showed it had added 73.5 lakh subscribers between September 2017 and November 2018. The government has cited this data as evidence of job creation. But this is misleading since only firms with more than 20 employees are required to register with the EPFO. A rise in subscribers could simply reflect workers moving from the informal economy into formal jobs, as the Chief Statistician of India said. Even workers who move between jobs could show up as new subscribers. Business Standard found of the 62 lakh new subscribers that EPFO added between September 2017 and July 2018, 15 lakh or 24% were those who had exited their EPF subscription from one job to rejoin later, with a new job. Facing criticism for rising unemployment, the main thrust of the government has been to argue that official statistics do not capture the jobs being created through entrepreneurship. Prime Minister Narendra Modi pointed to a pakoda seller as an example of that, in a TV interview in January 2018. To back its claims, the government is planning to release a survey of beneficiaries of the Micro Units Development & Refinance Agency or MUDRA scheme which advances loans to small scale entrepreneurs, the Indian Express reported. The NITI Aayog has asked the Labour Ministry to conduct the survey in a manner that captures both jobs created directly and indirectly by the scheme. Queries under the Right to Information by NDTV in February 2019 elicited no response on the number of jobs created through the MUDRA scheme. One proximate reason for the worsening job numbers, as field reports has exhaustively captured, is the economic upheaval caused by the government’s demonetisation decision, followed by the botched-up implementation of the Goods and Services Tax. But the Modi government has dismissed this possibility, citing India’s rising Gross Domestic Product. “Is it possible to conceive that such high nominal growth despite controlled inflation will not lead to any job creation?” asked Finance Minister Arun Jaitley in February 2019. While some have argued the jobs data itself calls into question the veracity of the GDP numbers, another possible answer might lie in the State of Working India report released by the Azim Premji University in 2018. The report found that India has struggled to convert high economic growth into jobs, with a 10% increase in the Gross Domestic Product resulting in less than 1% increase in employment. It found wages had not kept pace with the rise in labour productivity, with 82% of male workers and 92% of female workers earning less than Rs 10,000 a month, and 90% of the industries in the organised sector paying less than the minimum wages. A report released by the International Labour Organisation in 2018 estimated that 77% of employees in India will have vulnerable jobs by 2019, indicating poor quality of jobs. To address some of these challenges, the Modi government said it would merge 44 existing labour laws into four labour codes on wages, social security, industrial relations and occupational safety, health and working conditions. One code was tabled in Parliament but could not be passed. The others were in draft stage. As one labour law replaces four existing laws, will something be lost in the fine print? 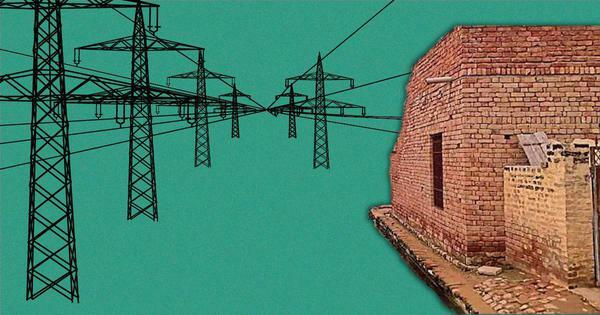 The Modi Years: Do more Indians have access to electricity?